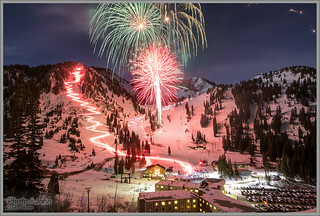 The annual New Years Eve torchlight parade and fireworks at Alta Ski Area. I guess I can call this a tradition now since this is the third year I've taken pictures of it. And every year it ends up being one of my most popular photos. It is pretty spectacular so that's really no surprise.